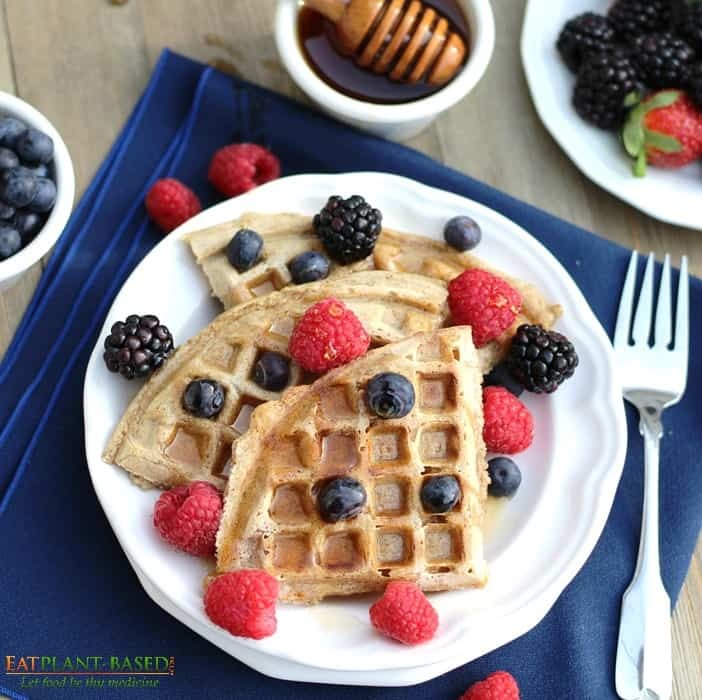 These gluten-free vegan waffles are healthy and delicious! They are light and fluffy on the inside and crispy on the outside. My husband and I have always loved waffles but, when we went plant-based in 2013, I thought we would never be able to eat them again. Thankfully, I was very wrong. I kid you not. 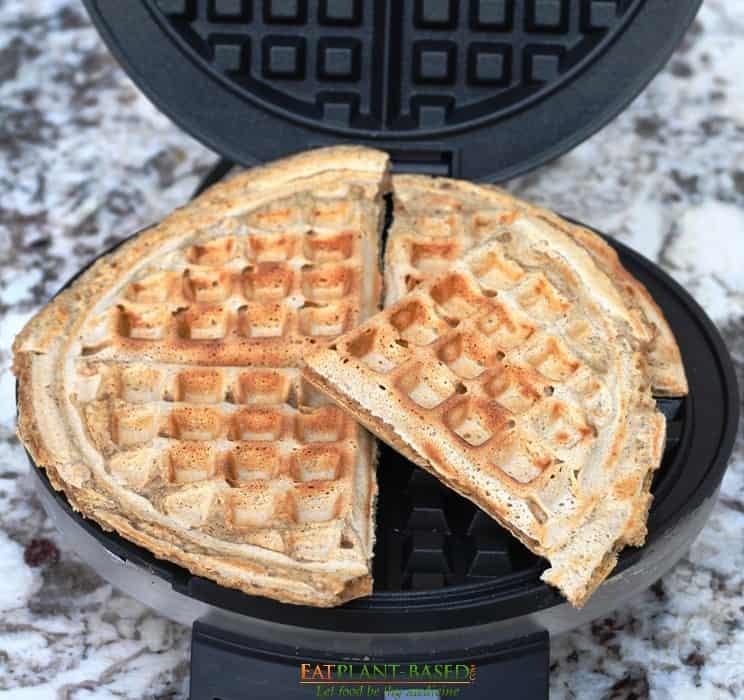 My husband and I haven’t had waffles in more than six years, because I haven’t been able to find a way to make them eggless, dairy-free, and taste good all at the same time. That is until now! I guarantee that friends and family who regularly eat dairy and eggs will find absolutely nothing to complain about with the taste or texture of these delicious waffles. They are light and fluffy on the inside and crispy on the outside. There’s even a slight nutty taste thanks to the ground flax seed in the flax egg. Light and fluffy on the side, these vegan waffles make a great breakfast or even dinner. Not too long ago, a follower messaged me that she had made my Banana Oatmeal Pancake recipe batter and used it in her waffle iron. She said it turned out terrific. Since then, I’ve been wanting to play around with the recipe to try and come up with a recipe for vegan waffles. We aren’t gluten-free, but both my pancake and waffle recipes do happen to be, because they are made with oat flour. It is so easy to make gluten-free oat flour at a fraction of the cost of those name brands. 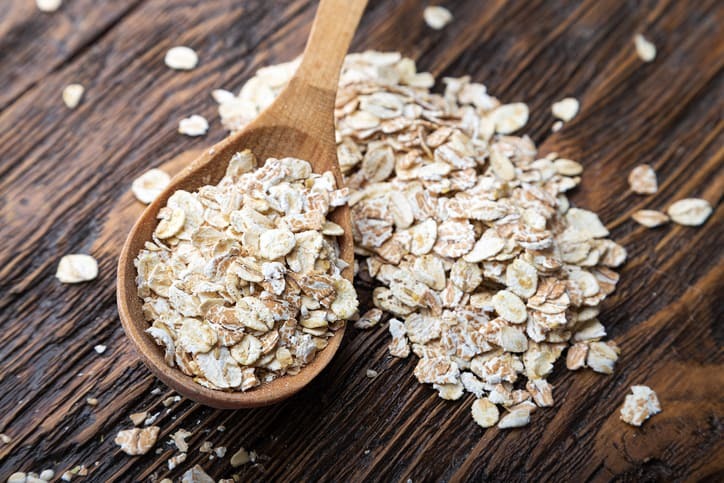 Making your own oat flour is as simple as grinding oats in your blender or food processor. My article, How to Make Oat Flour & 10 Recipes, shows how easy it is. 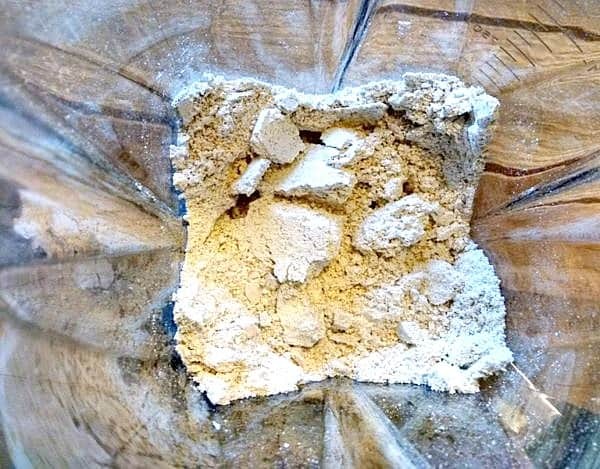 Making oat flour can be done in less than 5-minutes. I decided to use some flax egg in this recipe, and it worked wonderfully. 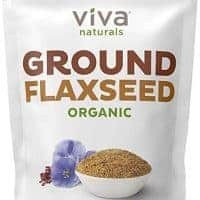 If you aren’t sure what flax egg is, it’s a vegan egg substitute used in baking. 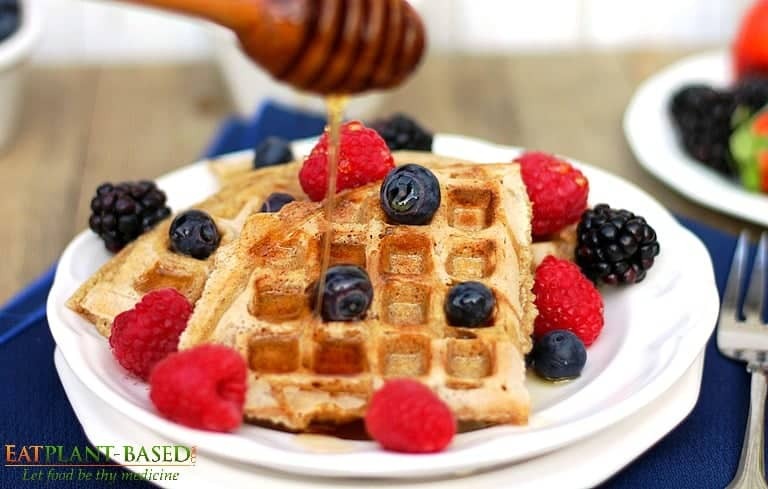 Flax egg is a perfect binder for this gluten free waffle recipe. Once these two ingredients are blended in a blender, the product has the consistency and thickness of egg whites. 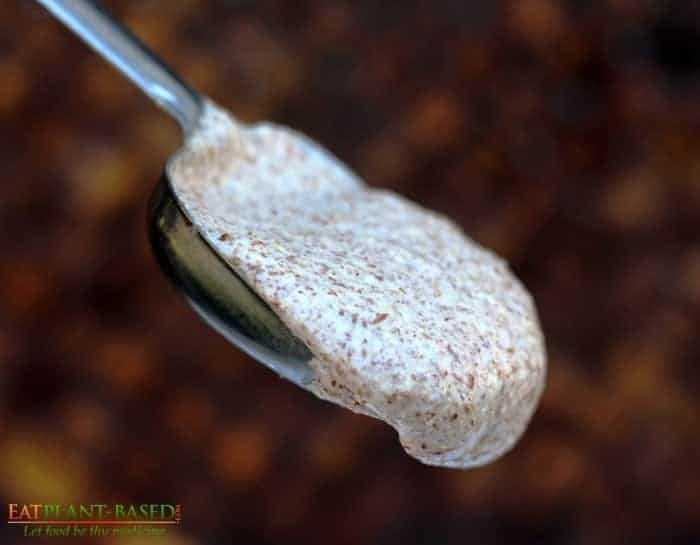 This is a flax egg and shows the consistency. It can be used just like an egg in many of your favorite baking dishes, and it works perfectly in this waffle recipe. Checkout the video below to see how easy it really is. Believe it or not, there is no oil needed for this recipe. Not even any cooking spray on the waffle iron. I have a non-stick iron that I love, and it cost less than $30 on amazon. I’ve included a link to it at the bottom. Take a peek at how clean it is after cooking 4 waffles below. It barely needs to be wiped off. Now, that’s my kind of clean up! Non-stick waffle irons are a must. Occasionally, we like to eat a breakfast food for dinner, and that’s exactly what we did with these waffles. They are that good! 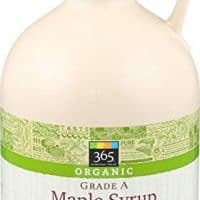 We topped ours with fresh berries and pure maple syrup, and they seriously tasted every bit as good as any waffle I’ve ever had. My husband, Mickey, gave them two thumbs-up. That’s a serious compliment! 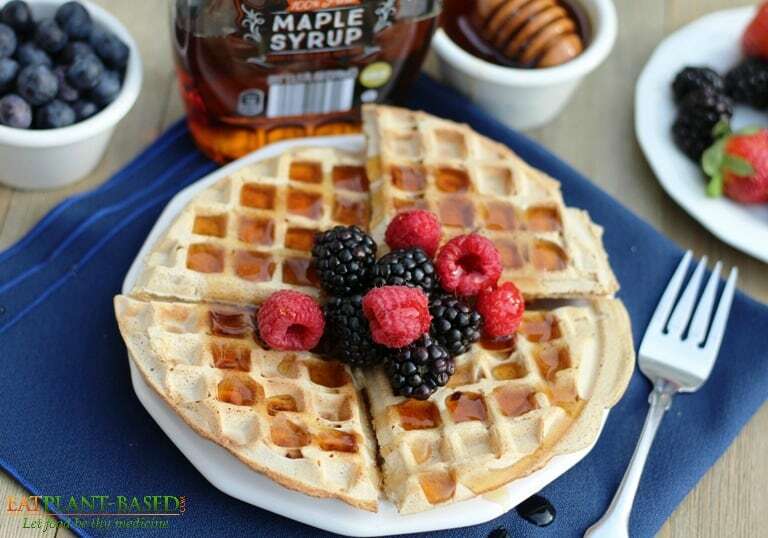 Topped with maple syrup and fresh berries, these waffles are a WINNER! My husband and I have always loved waffles but, when we went plant-based in 2013, I thought we would never be able to eat them again. Thankfully, I was very wrong. 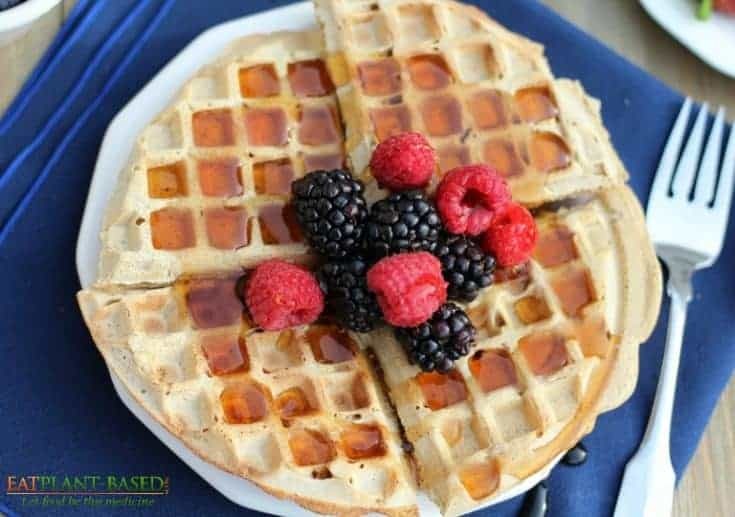 These gluten-free vegan waffles are healthy and delicious! Preheat nonstick waffle iron. I used a setting of 4 on mine, and I've included the brand I recommend below. Make oat flour by placing oats in blender and blending for less than one minute, or until they become a fine powdery flour. Remove from blender and pour into large bowl. Make the flax egg. To do this, I don't even wash my blender after making the oat flour, because the flour falls right out with a little tap and is plenty clean for making this egg substitute. Combine the flax seed and water and blend in blender. It will become like the consistency of egg whites. Scrape from blender and set to the side. Add the baking powder and salt to the large bowl with oat flour and whisk to combine the dry ingredients well. In a medium sized bowl, add almond milk, vanilla, maple syrup, and flax egg. Whisk together the wet ingredients. Pour the wet ingredients into the large bowl with dry ingredients and whisk thoroughly. The batter needs to be the consistency you see in the demonstration video, so if yours seems a little thick, add a couple more tablespoons of almond milk to thin down. 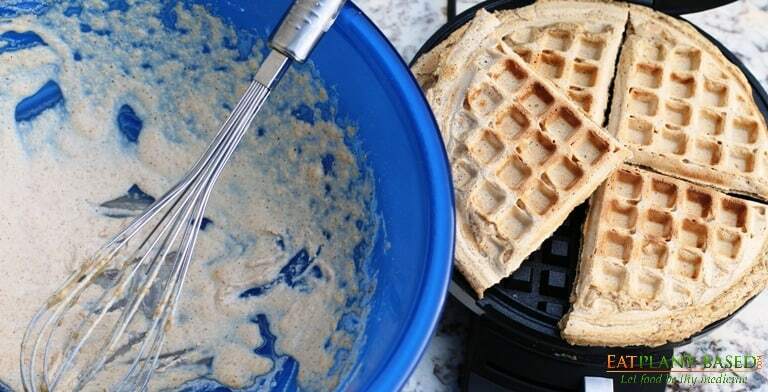 Pour spoonfuls of batter into waffle maker and close lid. Allow to cook for 5-7 minutes. Then lift the lid to see if they are brown enough for you. I like mine golden brown. 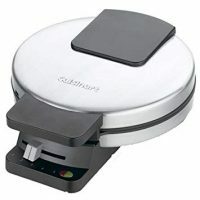 This should make about 4 large waffles, depending on the size of your waffle iron. Top with fresh berries and maple syrup and serve immediately. To reheat later, simply place in toaster oven.